The first group of invitations to the 2014 flagship killing OnePlus One have gone out. OnePlus has used contests, given invites to forum members, and is now just sending out the first batch of invitations to those who have expressed an interest in buying the device. Since OnePlus has announced that it would produce the 64GB black model first, that is the version that should be available first, by invitation. The price of this model is $349. Once the white 16GB model is ready, it will be priced at $299 lock, stock and barrel. 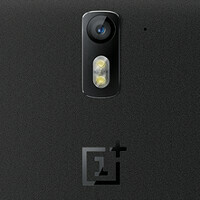 The OnePlus One features a 5.5 inch IPS LCD screen with resolution of 1080 x 1920. That works out to a pixel density of 401ppi. A quad-core 2.5GHz Snapdragon 801 is under the hood with the Adreno 330 handling graphics. 3GB of RAM is on board and 64GB of native storage is available.The 13MP rear-facing snapper has an f/2.0 aperture which means it takes great pictures in low-light conditions. The front-facing camera weighs in at 5MP and a 3100mAh battery powers up the device, which has Android 4.4 and Cyanogen Mod 11S pre-installed. According to OnePlus, everybody who wants a OnPlus One should be able to snag an invite to the party of the year for smartphone buyers. Actually, the party isn't just for smartphone buyers. This is a party for those who purchase flagship models of smartphones. I think it's kind of weird that they're doing this. What company says, "Okay guys, you can give us your money now. But only some of you. F**k the rest of you." Maybe they didn't say that exactly, but that's how I feel right now. You're on here too! You're everywhere! Wow guys look one plus has some invitation . Wait what the heck who's one plus any ways?? Ahh never mind guys lets wait for z3 and note 4 . I've heard they're coming this fall. Who's one plus again? Most of you don't understand how it works and why OnePlus chose this but it makes sense from their position. I understand why they are doing that, but from consumer point of view it is trololo. It's because they have a limited supply. They are not a big company and are selling the phone almost at cost. They have to slowly build up their revenues so they can produce more. Nexus 5 in Red. Sorry Oneplus, too late with this. Stupid invites. This company thinks they will run out of stock if they just sell their phones straight away. Too bad without marketing and global release their phones will be collecting dust. What makes it worse is that it's an invite only? I see a DOA product. This whole OnePlus phone is nothing but a marketing gimmick. They wont have enough phones to meet the demand. Why? Because they building just a few and only a few because they selling them at cost. Amazon sells tablets at cost, but they make it up with sales from books, video, music, etc. What does OnePlus have to gain by selling it at cost? Ask yourself this? Gain marketshare with the few they are building and selling? This is just a publicity stunt and that is all. Too bad Cyanogenmod tainted their reputation by pairing up with OnePlus. I like everyone else was hyped to get this phone at first. Not now. I am done with this gimmick. I am gladly paying more to buy an LG G3 or Galaxy Note 4 or any phone that is in stock and available when I wish to purchase it. Why are they selling them at cost? If you had any business and marketing sense, you would know why. They are a new company and do not have the name recognition of the other big players. No one would try the phone if it was $650 like the other flagships. At $300-$350 people are willing to try it out. Once they get some market penetration and develop a good reputation and trust, they can begin to start charging more. It's hardly even worth the effort to comment on this fkkk-d company. They are just scammers. Real companies take pre-orders and make phones. Lame [a]ss invite system killed my interest. Will use my saved money on Galaxy Tab S 8.4 instead. I gave up on this company a long time ago, the OPO software is glitchy and their marketing is a fail. The stable version of CM 11S will be out soon and it will be running very smooth.